Will Batam city grow as a work-and-play digital hub in the toughest time in business? A news of novel investment seemed to be an old story being told repetitively. Who doesn’t love a sweet investment story while the city island is now being occupied by many job seeker and unemployment?. Nothing felt so new on the recent news of a $700 million technology park with an international data centre, an incubator for start-ups and apartments for technopreneurs and programmers that are estimated will rise up in Nongsa, which is only a 40 minute ferry ride away from Singapore. In the world where everything is measured with money and deliverance, there exist two types of business; those that have had tough times and those that are going to have tough times. Generally tough times relate to financial dramas, either a lack of business, or a collapsing market that goes broke or a combination of the two. Batam city island as the doorstep to Indonesia is a non-exception. For many years, Batam has been swayed by national Indonesian politician, and official who turns out to become a corrupted property behemoth. Batam, as a city island is a home for about 2 million people, has mainly heavy and dirty industries with close proximity to Singapore and sheltered from natural disaster. Let us see the bright side of the story. 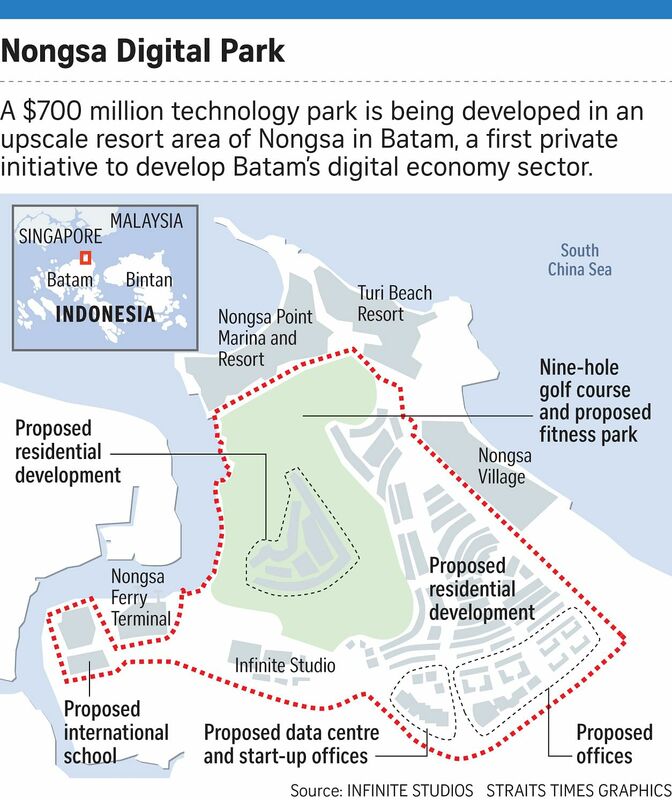 The 100ha Nongsa Digital Park, slightly bigger than the Singapore Botanic Gardens, will be Batam’s first large-scale private project. It is the latest project by Infinite Studios, a Singapore-based integrated media entertainment and creative services company which has produced movies and animated TV series at its Nongsa facility, including HBO Asia’s Serangoon Road and The Garfield Show. Infinite Studios’ Nongsa facility will be part of the new park. The company’s chief executive, Mr Michael Wiluan, told The Straits Times that the park will be a “lifestyle digital campus that basically allows people to live or play”. The project comes as the Singapore and Indonesian governments explore ways to expand bilateral cooperation in new industries. Office spaces will be open plan, well lit and well ventilated, and involve a “mixture of semi-industrial and green”, which could be further customised. Golf buggies, electric cars and bicycles will ply the private roads. The park’s residents will form the “backbone of technology maintenance”, including in engineering backups, data processing and customer service, he said. Mr Wiluan, an Indonesian and a Singapore permanent resident, is the son of Indonesian oil and gas tycoon Kris Wiluan, chairman of conglomerate Citramas Group which owns land in Nongsa covering the digital park, a nine-hole golf course, Nongsapura ferry terminal and Turi Beach Resort there. The park’s first phase, which is expected to be completed by the year’s end, will see three two-storey office blocks erected, said Infinite Studios’ senior adviser, Mr Marco Bardelli. The park secured a second tenant, Singapore-based cashless payment company Liquid Pay, last November. It is also in talks with six international data centre operators and 80 companies, half of which have a representative office or headquarters in Singapore, Mr Bardelli added. The company’s chief executive, Mr Michael Wiluan, told The Straits Times that the park will be a “lifestyle digital campus that basically allows people to live or play”. A spokesman for the Economic Development Board told ST the agency, “together with other relevant agencies, is prepared to link companies up with park operators and facilities managers”. Trade body Singapore infocomm Technology Federationsaid it has organised visits for companies to explore expansion opportunities on the island. Nongsa offers “a strategic location” for regional and Singapore-based tech companies looking to expand into the region, its lead for Singapore Enterprise Chapter Alicia Bok told ST. But industry watcher Alfred Siew warned that many technology parks floundered because they did not attract enough similar businesses that support one another. “It has to be compelling enough for people to want to go there instead of Jakarta, where there (are) also talent and many start-ups,” he said. Previous articleWill Indonesia’s first private airport to open in Bintan?